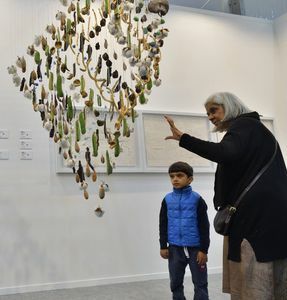 Recently the India Art Fair, which was launched in 2008 by Neha Kirpal, concluded its 10th edition. Last year, the MCH Group, the Swiss fairs, and behemoth events, invested in the India Art Fair. While such a fair provides a much-needed aesthetic acupuncture to a city like Delhi, it also helps instigate and inspire the lives of culturally conscious minds while creating a healthy business. So, the move by MCH is a smart one. The India Art Fair had the aesthetic imprints of the new director Jagdip Jagpal and her team, including artist UBIK and VIP relations director Noel Kaddar. The expertise of MCH, also the owner of the preeminent Art Basel (Basel, Miami and Hong Kong) in fair production, was conspicuous at the NSIC grounds, the location of the annual event. This year, I saw many new faces from the art world, new collectors, young curators and writers. Of course, one would not miss the BMW art car by celebrated artist Jeff Koons. Jagdip Jagpal’s arrival on the scene has brought in a breath of fresh air. The London-born Indian-origin director, now living in Delhi, has had to quickly absorb the nuances of the Indian art scene. Jagpal, who has great faith in the Kochi-Muziris Biennale, provided space for the same at the art fair. Anita Dube, Jitish Kallat, Riyas Komu and myself were invited to an opening-day panel discussion moderated by curator Michelle Lun from the Asia Society, New York. The Asia Society awarded the Kochi Biennale Foundation (KBF) its prestigious Game Changer Award, which was accepted by Riyas Komu and me on behalf of the foundation. It was a proud moment of recognition for us, our entire team and trustees, as well as our sponsors and patrons, and, the people of Kochi who supported the dream of a biennale in India. As at most art events, we had to come to terms with the fact that we cannot see everything in a week. There were too many parallel exhibitions, talks and tours. Some of my personal highlights of the week included seeing Pooja Sood’s Khoj International studios that has an exhibition of small-scale artworks by young artists, Shalini Passi's great collection of art works and Tarana Sawhney hosting on behalf of the Tate museum. The energetic Feroze and Mohit Gujral’s Gujral Foundation organised a brilliantly curated exhibition at their project space, 124 Jor Bagh, an old building that has been transformed for special exhibitions. This year, the space was dedicated to photography. A trustee of the KBF, and design legend V. Sunil hosted a Motherland magazine party at his Dhan Mills office, and Manish Arora held a mini-retrospective of his greatest pieces from the catwalks in an adjoining ex-warehouse building. Dhan Mills Compound is quickly turning into a must-visit place in the capital. Another highlight was Riyas Komu’s Holy Shiver at Vadehra Gallery. In my knowledge, Komu is one of the finest artistic minds in India and his works are an acerbic look at contemporary social issues, much needed in the fractured political climes that we live in. His works confront you with questions on religion, Constitution, nationalism and concerns of the minority. Artist friend Anju Dodiya created visceral drawings, paintings and sculptural paintings on textiles collected from Germany and India. Her creations are on show at the Bikaner House. The exhibition is Dodiya at her best, and it lingers in my thoughts. Another must-see event was 50 years of Vivan Sundaram’s work in a poignant retrospective, curated by Roobina Karode at the Kiran Nadar Museum. Kiran Nadar—patron, collector and an astounding mind that leads with tremendous vision—and her better half, Shiv Nadar, are a great asset to the country. We need more of such patronage of arts and a strong private and public partnership to build the necessary arts infrastructure, especially in our nation’s capital. The India Art Fair is a good reason to think on those lines. When such events are held, one must also think of making them more accessible to the common man and not confine it to a cocoon within the city.